The Migraine Relief Guide by Elizabeth Hayden was brought to my attention by one of our discussion forum members. Still looking for help for her Migraines, our member wanted to know if anyone had any experience with the web site www.TheMigraineRelief.com. When I went to check the site, I found that it was a site to promote and sell this book. 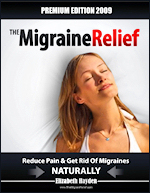 The site says, "The truth about mysterious migraines has finally been exposed!" and "You are about to discover the REAL secrets behind this truth. A truth that will allow you to take control over migraines and immediately change your life." Yes, that seemed overblown to me, BUT below that is a letter from the author, Elizabeth Hayden. Hayden says she's a Migraineur, and goes on to say, "I compiled all my tips, findings and secrets into a concise and complete guide on how to get rid of migraines without using medications and following very simple steps to reduce the pain and prevent them from striking again." So, I decided maybe she was a Migraineur who had indeed put her own research and experience in a book. After all, that's what I did. Maybe I could learn something from her. Maybe the web site had been hyped up by someone marketing the book for her. I'd buy the book and give her the benefit of the doubt. • You download the book in PDF format. • If you want a printed copy, you have to print it yourself. • The entire book is all of 65 pages long, and with the introduction, table of contents, etc., chapter one doesn't start until page 9. • I paid $37 for 53 pages of content that I'd have to then pay the expense of printing if I wanted a printed copy. Some of the basic information is outdated. It says there are 28 million Migraineurs in the United States. That was the correct figure about 10 years ago. She says Migraine affects almost 10% of the population. The correct statistic is 12%. Hayden calls herself an "Author and Migraine Expert," yet she lists types of Migraines and headaches that are not part of the International Headache Society's International Classification of Headache Disorders, 2nd Edition (ICHD-II), the gold standard for diagnosing and classifying headache disorders. Vasodilation is listed as "one of the known causes" of Migraine. The vascular theory was abandoned years ago. When discussing "causes" she intermingles causes and triggers, making that section confusing at best. When discussing pharmaceutical means to treat Migraine, specifically Migraine abortives, Hayden states, "These medications are often pain relievers..." She says there are two types of medications for Migraine -- abortive and preventive. She mixes abortive and rescue together. There was nothing in this book that was new to me. Nothing. Some of the information is outdated; some of it is just wrong. Much of the accurate information in the book, such as the four possible phases of a Migraine attack, can be found right here on this site -- free of charge. If you want to start or build your Migraine and headache library, and I think that's an excellent idea, take the #37, and go buy two or three good paperback books with it. Another reason to stay away from this book is that, despite the "no-questions-asked" guarantee on their web site, getting a refund is proving very difficult. Emails requesting a refund were ignored. I paid via PayPal and had to file a dispute with them to get the refund. Usually, there's something good to be found in any book. I have to say that this is the first "Zero-Star" review I've ever written, and it makes me sad.